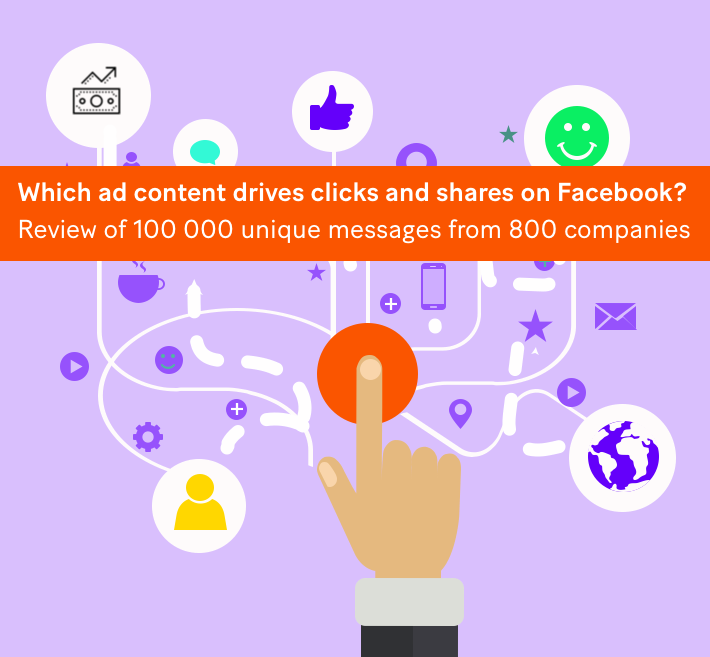 Have you ever wondered how you should craft your Facebook messages and advertising content to reach the maximum number of likes, shares and clicks? A group of researchers at Wharton and Stanford (Lee et. al, 2015) decided to find out. They coded up the content of more than 100 000 unique Facebook messages from 800 companies using Amazons Mechanical Turk and Natural Language Processing Algorithms. Here's what they revealed! Starting on a high level, the researcher found that messages that are complex to read generate less likes and comments, whereas shorter messages are commented more. Using blanks (My favourite brand is...") and asking questions increases the ratio of comments with 69% and 200% respectively. Asking for likes increases the ratio of likes and comments, whereas asking for comments increases comments but the the cost of fewer likes. Brand-personality related content (humour, emotions, mentions brand's of philanthropy) increases the likelihood of consumer comments and likes. But it generates low click-through rates (and thus website visits and potential sales). More informative content (deals, price comparisons, availability, product features) have a negative impact on comments and likes when included in messages in isolation. Another important fact to consider is that Facebook's EdgeRank algorithm uses a firm's current engagement to determine the future reach of the firm's posts. Reportedly posting information-content will over time shrink a firm's reach. However, when combing the brand content with informative content, it increases engagement. To summarize, many companies focus their communication in social media on either brand building content or informative content. Possibly reflecting the different departments responsible for the underlying business operations. But, to grow the business impact from their social media marketing, companies should try to combine informative content with brand building content. So, the next time you advertise your shiny new product or black Friday deal, don't forget to also mention your brand values or that amazing rainforest saving project you started last year! How much initial promotions should you give new customers?